She belongs to New York, and the " Dreadnought" is her name. Bound away in the " Dreadnought," to the westward we go. Bound away in the " Dreadnought,1' to the westward we steer. They will give us three cheers, while the tears freely flow. Saying, God bless the " Dreadnought," wheresoe'er she may go. For to round that black rock where the Mersey does flow. Bound away in the "Dreadnought," to the westward we'll go. Oh ! 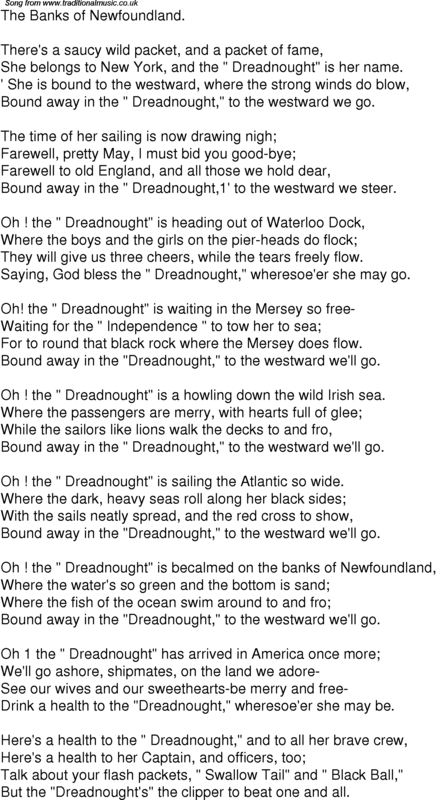 the " Dreadnought" is a howling down the wild Irish sea. Bound away in the " Dreadnought," to the westward we'll go. Oh ! the " Dreadnought" is sailing the Atlantic so wide. Drink a health to the "Dreadnought," wheresoe'er she may be. Talk about your flash packets, " Swallow Tail" and " Black Ball,"
But the "Dreadnought's" the clipper to beat one and all.